I think it is interesting that visually the lyrics look so well with the illustrations. As much as I love just looking at each image, the icing on the cake is the back story to be found in the links … Carol’s comment about “golden years” … Jude loving the bit of empty wing (me, too) … and then linking into Spirit Cloth and realizing that I now know (some) of the people behind the comments. I could happily lose myself in the woven words forever … thank you for taking me on a flight of fancy this morning. Started this blog when I first joined Jude’s circle of cloth conjuror’s over at Spirit Cloth, it’s been a good way to record the project and see what sidelines have developed. More fantasticalness…. I can’t believe how beautifully these are coming together! the scanning and editing is getting a lot easier with practice, they were all drawn to give the words space and weight, like the young drummer Willem said back in 2008 when asked how he felt about playing with such old guys, “It’s about the music, man”… I love that! 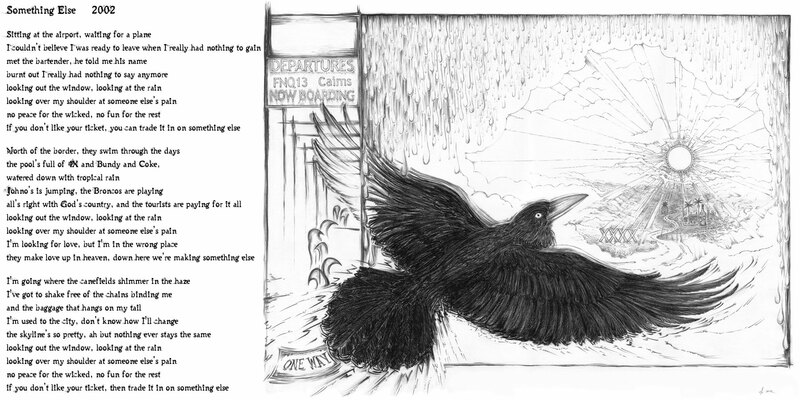 Flying north to the shimmering cane fields… Beautiful imagery in the song and the illustration, Mo. A beauty! moving to Far North Queensland is still a dream but Old Man Crow & Ariel don’t want to move out of the Big Smoke! Hmmm… Must say I agree with them but I’m getting too old for the humidity, I think. Wonderful country though. the really big bird eating spiders are a bit of a worry too!